Am so honored to have Sala of Veggie Belly guest on my India Street Food Series. One day I wish to be able to photograph as well as she does! Super talented internationally known food blogger, many of you might have followed her move from Northern Virginia to Portland, Oregon in her 'A Vegetarian Road Trip Across America. What I’m Seeing Doing and Eating' and if you click the link there is also a fantastic giveaway! A jet setting software entrepreneur by day and a food blogger by night, you can read about Sala's most memorable vegetarian foods/meals she's eaten on her travels in her about page. She's been to Iceland, Singapore. Fiji, and The Sahara among many other corners of the world, and a birdie tells me she is going for a quick visit to Israel sometimes this winter. Make sure to follow her on twitter @veggiebelly and make sure to LIKE Veggie Belly on Facebook, you won't be disappointed! A heartfelt thank you goes from me to Sala for being a guest in the midst of her move and gracing these virtual pages with the first dish she cooked in her kitchen in Portland! I always enjoy Shulie’s lovingly created food through her blog. I’m thrilled to be guest posting for Shulie’s amazing Indian street food series. Today I bring you a famous snack from the beaches of Madras, India (now called Chennai and the capital of my home state). No trip to the beach in Madras is complete without eating a little newspaper bundle of thenga (coconut) manga (raw mango) Pattani (peas) sundal. Street vendors, carry around a bucket of this coconutty, tangy, salty sundal, and hawk “Thenga manga Pattani sundal!”. There is no greater pleasure than eating this finger licking yummy sundal sitting on the sand, with the balmy sea breeze blowing through. Vatana peas are a kind of dried white peas. They are easily available in Indian stores. Apart from sundal, vatana peas can also be used in curries. They are cheap, delicious, filling and last forever in the pantry. 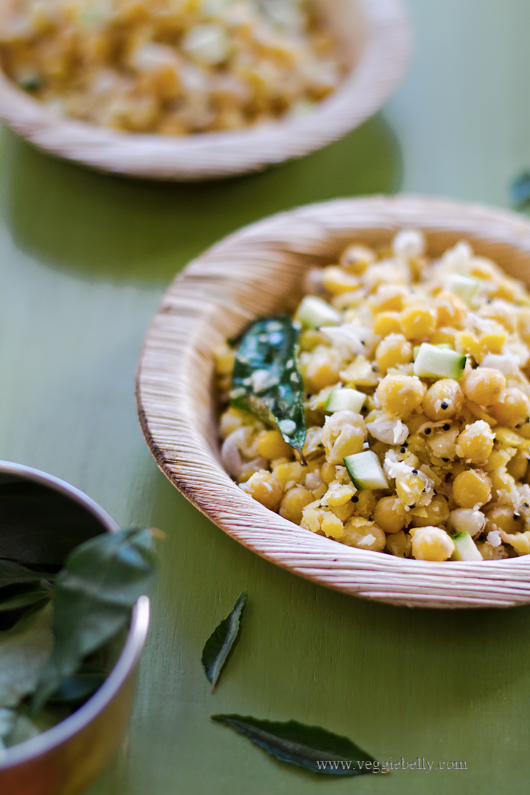 If you haven’t tried vatana peas before, this sundal recipe will be a great place to start. If you can’t find vatana peas, use 3 cups of cooked (or canned, drained) chickpeas instead. This is a very forgiving recipe. You can change the amount of coconut and mango to your liking. If you want to add color to the sundal, add ¼ teaspoon turmeric when sautéing the chilies. 1 cup dry vatana peas, also called white peas. Available in Indian stores. 1-2 green chilies, slit. Optional. 3 tablespoons shredded coconut. Available frozen in Indian and Asian stores. Rinse the vatana peas and soak them in cold water for 8 hours. Then discard any loose and floating skin. Drain the peas. Fill a large pot with plenty of water. Add a generous amount of salt to the water. Bring to a boil, and add the soaked vatana peas. Boil the peas till they are soft, but still holding their shape. About 30 minutes. Drain the cooked peas. If there is more loose skin, pick it out and discard. Heat oil in a skillet. Add mustard seeds. When they splutter, add the chilies, asafetida and curry leaves to oil. Cook for about 30 seconds. 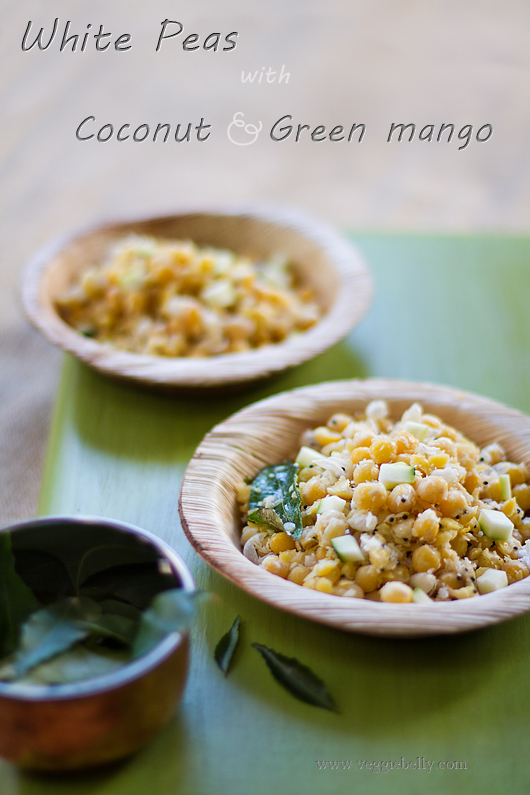 Toss in the cooked vatana peas, shredded coconut, diced raw mango and salt. Turn off heat and mix well. What a beautiful guest post and dish! Great addition to the street food series! her pictures are absolutely stunning! 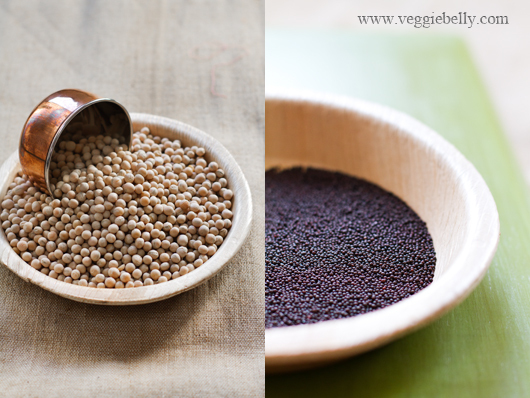 I've never had black mustard seeds, they look interesting! What an absolute delight to see both of you together here!! Its the simple, intensely flavored recipes like this that i Love!! Beautiful photographs, as always Sala. Thank you Shulie for having me guest post! I always make this dish but as ignorant as I am I never knew what you call it :-) Thanks for letting us know Sala! Yum yum! I love this dish! Gorgeous photos as well. I love this healthy yet flavorful dish, something I can have to balance my diet of desserts and sweet treats. I love this series and this dish looks fantastic. I'm so glad I've found some ethnic markets so I don't get all freaked when I see unusual ingredients; now I know where to find them! 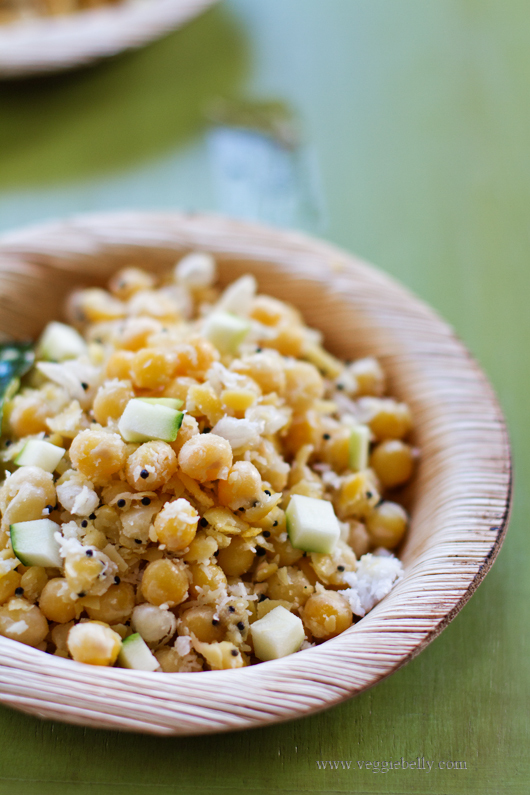 Those vatana peas look like chickpeas :) beautiful photos and recipe! Not familiar with vatana peas - they look like chickpeas and good to hear that they work as a substitution here. Great recipe and guest post! I have not tried vatana peas before, thanks for the introduction! Thanks you everyone for your sweet comments and support of this Indian Street Food series. On Twitter Ken @hungryrabbitnyc asked what white peas look like and most of us who are not familiar with it indeed are curious. Sala's @veggiebelly's response was: 'white peas look like small dry chickpeas but whiter&smoother. kinda like blackeye peas, but rounder&no eye' She also said 'and they are great cooking in a tomato based curry with a touch of chili powder and turmeric' I hope this helps. As Sala mentioned in the post chickpeas can be a substitute. Really beautiful stuff. Great guest post! Perfect little recipe just filled with the flavors of India! I so want to spend several months in India, wandering around and tasting the food. Especially the street food. This is yummy ! I just LOVE Green Mangoes! In the Philippines, we have it as a snack food or a side dish. This is a fantastic new idea for my dinner table. Thanks for sharing this great post!